Many cities are hilly. 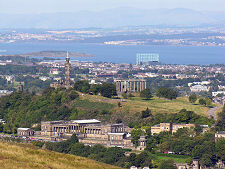 Like Edinburgh, both Rome and Sheffield are built on seven hills, though one more famously than the other. But not many cities make use of the third dimension quite as effectively as Edinburgh. Wherever you go in this amazing city you find hills: in parts of the Old Town they are so steep that buildings facing one way at a lower level have buildings facing the other way placed on top of them. 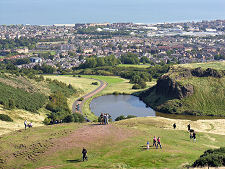 But while Edinburgh is not unique in having hills, there can be very few cities that can boast anything quite as spectacular as Holyrood Park. 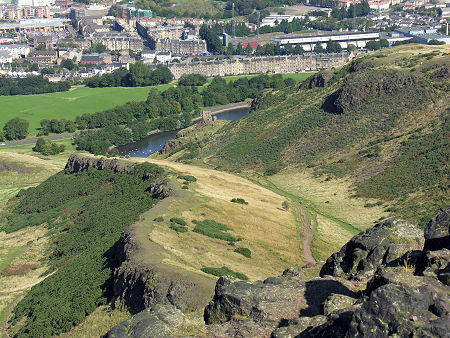 Lying just to the south of the Royal Palace of Holyroodhouse, which itself stands at the east end of Edinburgh's Royal Mile, Holyrood Park occupies some 650 acres, is roughly circular in shape, and measures about a mile across in any direction. Some of the outlying parts of the park are the sort of level mown grass you'd expect in many city parks, but most of it can only be described as a mountainous wilderness, tamed just sufficiently to make it accessible to the city's joggers, dog-walkers, picnicking families and anyone wanting to enjoy some of the best viewpoints in the city. 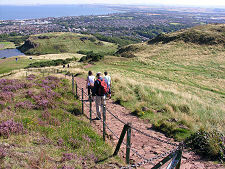 Holyrood Park's highest point is at the summit of Arthur's Seat. At 251m or 823ft this is relatively modest in height by Scottish standards, but when seen from the north there can be no doubt it has all the characteristics required of a mountain in terms of its steepness and the distinctiveness of its summit. 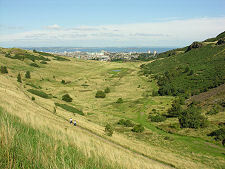 Arthur's Seat lies towards the southern side of Holyrood Park. North and north west from it stretch a series of lines of rocky outcrops. The most notable of these is the most westerly, which forms Salisbury Crags on its western side, an exposed face of rock that rises almost sheer for 150ft for a distance of nearly three quarters of a mile. As the crags rise from the top of a 400ft high grassy slope they form an incredibly impressive landmark when seen from much of Edinburgh. 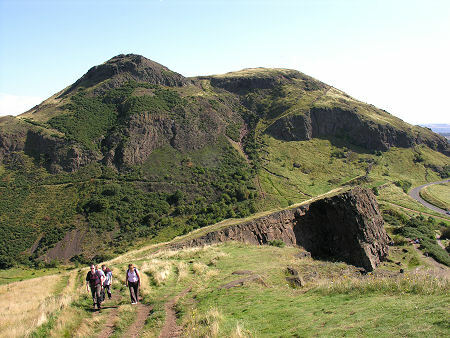 The origins of Holyrood Park date back some 340 million years to the early Carboniferous period when a volcano erupted here. Over the following tens of millions of years the evidence of the eruption was buried in thick layers of sediment, and the layers were later tilted so they dipped from west to east. With the passage of much more time, much of this structure was eroded away, leaving the parts made of the hardest rock standing out most prominently. Arthur's Seat itself is all that remains of the core or plug of the volcano that erupted here. 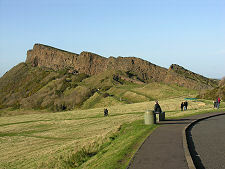 Salisbury Crags and the outcrops that run parallel to it are the remains of once horizontal intrusions of lava that seeped sideways into the surrounding rock from the volcano when it was active. The next key development in the story of Holyrood Park occurred rather more recently, a mere 2,000 years ago. 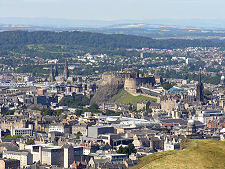 The area now covered by the park became home to no fewer than four iron age hillforts built by the Votadini tribe (who were also probably the first to fortify Edinburgh's Castle Rock). One of these occupied the summit of Arthur's Seat itself. 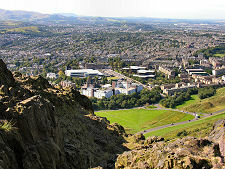 Moving on, it seems likely that Holyrood Park was set aside as a royal hunting park as earl as the 1100s, perhaps when David I divided the land between his newly formed abbeys at Kelso and Holyrood (the latter standing immediately to the north of the park). 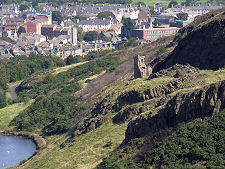 From the 1400s Scotland's monarchs increasingly came to prefer living in the palace that grew up beside Holyrood Abbey rather than in the less comfortable castle at the other end of the Royal Mile, and in 1541, Holyrood Park was enclosed as a Royal Park. 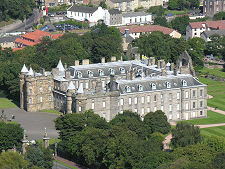 By the Victorian era Holyrood was still a Royal Park, though one that by now was open for the enjoyment of the residents of the city. Queen Victoria and Prince Albert sought to make their mark with a number of landscaping projects, including the construction of a number of lochs: but (thankfully) stopped short of destroying the park's wilderness feel. 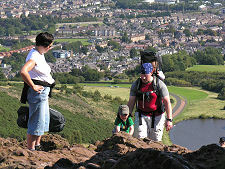 Today's Holyrood Park is looked after as a scheduled ancient monument by Historic Environment Scotland. There are three parking areas for visitors near three of the gates into the park, plus a parking area near Dunsapie Loch, beside the one-way high level road that climbs up behind Arthur's Seat. Motorists should be aware that most of the roads through the park are closed for most of every Sunday, plus on other occasions for events. 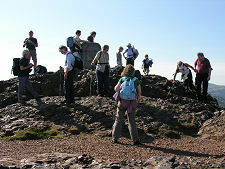 The most popular spot in the park is the summit of Arthur's Seat. This is usually climbed up its relatively gentle eastern slopes, where a network of grassy paths come together before leading up a well-made path of stone steps to the summit. The views from here are truly magnificent, extending for many miles in every direction. 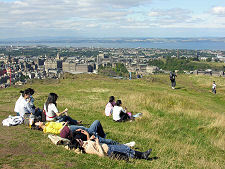 Interestingly, however, Arthur's Seat is not the best place in the park for views of Edinburgh itself. 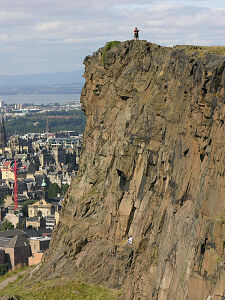 For these you should find your way to the top of Salisbury Crags. Though lower in altitude, the closeness of the crags to much of the city results in a view that is entrancing: though remember to pay attention to where you are putting your feet - the cliffs here are sheer. 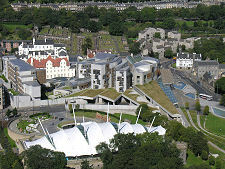 There is only one building in the main central area of Holyrood Park. St Anthony's Chapel stands on a rocky outcrop above St Margaret's Loch on the north side of the park's central area and seems to have been a chapel of unusual design associated with Holyrood Abbey. Most of the roads in the park are closed from about 9.00am to 3.30pm on Sundays (and occasionally for events and road maintenance at other times).